James Steffen is a film and media studies librarian at Woodruff Library. Emory Photo/Video. Is there a faculty or staff member at Emory who has an intriguing job or goes above and beyond to make a difference? James Steffen's gamble to leave Las Vegas for Atlanta paid off. 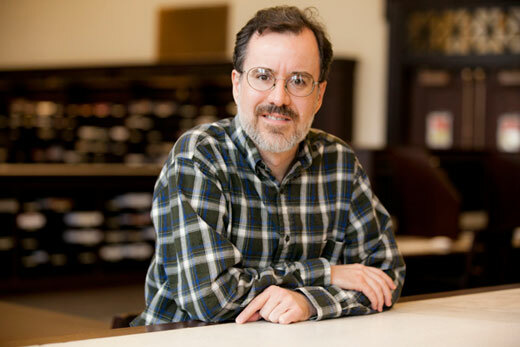 The film and media studies librarian at the Woodruff Library came to Emory as a graduate student in 1996 for his master's degree, then stayed on for his doctorate in Emory's Graduate Institute of Liberal Arts. Currently, he's writing a book about Soviet filmmaker Sergei Parajanov, whose original style of filmmaking and controversial lifestyle caused Soviet officials to imprison and censor him. Research for what Steffen says will be the first, full-length monograph on Parajanov in English took him to Armenia, Georgia, Russia and Ukraine. In addition to his wide-ranging knowledge of and interest in films, Steffen is an avid consumer of music from opera to classical to '60s and '70s rock plus Persian painting, music and poetry. His blog is "Dreams and Pomp," a title taken from a poem by the medieval Persian poet Hafiz. You can listen to a podcast he did from May 2009 on restoring "The Godfather" trilogy and earlier ones on Jean-Luc Goddard's "Breathless." Why did you stay at Emory after graduate school? I really liked the environment at Emory. I started working in the library as a graduate student and became interested in librarianship so that's why I ended up staying as the film and media studies librarian. I really like the staff at the library, just a wonderful group of people. As I was working on my dissertation, I became keenly aware of the value of libraries within academia. I was made aware of a whole range of resources that I wouldn't have discovered otherwise. There's no way I could have completed my dissertation without all of the different kinds of support here in the library. What are some highlights of the music and media library at Emory? One of the things I'm really proud of here at the music and media library is that we've managed to build up a very substantial media collection with over 17,000 DVDs right now, including feature films from a number of different countries — a number of titles that are unique holdings that literally no other library has in the country. This very large, very diverse collection supports research in a number of different national cinemas so departments all over campus use our collection, such as REALC (Russian and East Asian Languages and Cultures). We have a large collection of Chinese films, a very substantial collection of Latin American films. I've been told we have one of the strongest collections of African films in the country, too. What is the focus of your current work at the library? I'm really focused right now on how to enhance the educational experience with graduate and undergraduate students at Emory by collaborating more closely with faculty in pedagogy and designing assignments that use library resources. Another area I'm interested in is media literacy and information literacy. For instance, one of the things I've been doing for the last couple of years with a faculty member is an assignment where the students create and edit Wikipedia entries that are connected to the course. This way the students are actively involved in producing new knowledge. But they also learn about how Wikipedia works and what kinds of standards are used in evaluating information within reference works. Are you involved with film screenings on campus? I have curated some series in the past, and periodically introduce individual films. My other involvement with the film series at Emory is that I help them locate rental sources for films on an ongoing basis as they're developing their series. What are your main interest areas for films? I have an interest in world cinema generally and of course, Hollywood cinema, but my main research focus is in Soviet and East European cinema, especially in the Soviet era before the fall of the Berlin Wall and the Soviet Union. I'm also interested in film restoration. Access is always a great challenge for film studies as a discipline and for cinema as an art form. It's important to support film restoration to preserve our heritage but also to learn what's out there.